That's already the case at cosmetics supplier Revlon Inc. According to the McKinsey & Co. report cited above, Revlon now operates more than 500 IT applications in a private cloud managed by an external provider. This saved Revlon $70 million in the ﬁrst two years of the private cloud's operation, the report states. In addition, when a Revlon data center in Venezuela was hit by ﬁre, the company was able to shift those operations to a data center it runs in New Jersey in just two hours. "Moves like this, which suggest that cloud-delivered IT can be reliable and resilient, create new possibilities for the provision of mission-critical IT through external assets and suppliers," the McKinsey report states. The cloud can speed development times, too, an important factor in today's hyperspeed marketplace. Kumar of Tech Mahindra says many of his CIO clients use the cloud to develop and build LEADING THE DYNAMIC DATA CENTER While big data will be a huge driver of the coming growth in cloud storage capacity and data center build-outs, for many large enterprises, the mainframe still matters. Mainframes will play a central role in the large data centers that house big data, industry members say. And many companies still actively deploy mainframes to run their core applications, many of which are associated with long-term Service Level Agreements (SLAs). For example, at Customers Bank, former CIO Joe Bassani says he was quite happy with his legacy mainframe and data center system, which is also a long-term investment for the company. Further, he didn't like the idea of moving the data to an outside storage center; that would be too risky, given the bank's customer-privacy requirements. There was also the need for him to lead IT in securing all that data — and to meet industry and government regulations and requirements. "As to the core banking system, we ran it in-house," Bassani says. 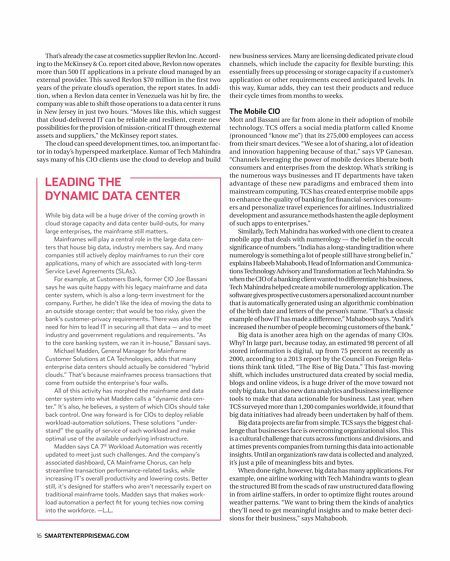 Michael Madden, General Manager for Mainframe Customer Solutions at CA Technologies, adds that many enterprise data centers should actually be considered "hybrid clouds." That's because mainframes process transactions that come from outside the enterprise's four walls. All of this activity has morphed the mainframe and data center system into what Madden calls a "dynamic data center." It's also, he believes, a system of which CIOs should take back control. One way forward is for CIOs to deploy reliable workload-automation solutions. These solutions "understand" the quality of service of each workload and make optimal use of the available underlying infrastructure. Madden says CA 7® Workload Automation was recently updated to meet just such challenges. And the company's associated dashboard, CA Mainframe Chorus, can help streamline transaction performance-related tasks, while increasing IT's overall productivity and lowering costs. Better still, it's designed for staffers who aren't necessarily expert on traditional mainframe tools. Madden says that makes workload automation a perfect ﬁt for young techies now coming into the workforce. —L.L. 16 SMARTENTERPRISEMAG.COM new business services. Many are licensing dedicated private cloud channels, which include the capacity for ﬂexible bursting; this essentially frees up processing or storage capacity if a customer's application or other requirements exceed anticipated levels. In this way, Kumar adds, they can test their products and reduce their cycle times from months to weeks. 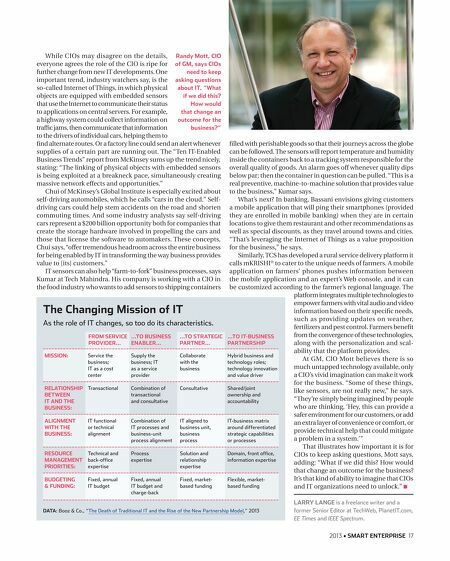 The Mobile CIO Mott and Bassani are far from alone in their adoption of mobile technology. TCS offers a social media platform called Knome (pronounced "know me") that its 275,000 employees can access from their smart devices. "We see a lot of sharing, a lot of ideation and innovation happening because of that," says VP Ganesan. "Channels leveraging the power of mobile devices liberate both consumers and enterprises from the desktop. What's striking is the numerous ways businesses and IT departments have taken advantage of these new paradigms and embraced them into mainstream computing. TCS has created enterprise mobile apps to enhance the quality of banking for ﬁnancial-services consumers and personalize travel experiences for airlines. Industrialized development and assurance methods hasten the agile deployment of such apps to enterprises." Similarly, Tech Mahindra has worked with one client to create a mobile app that deals with numerology — the belief in the occult signiﬁcance of numbers. "India has a long-standing tradition where numerology is something a lot of people still have strong belief in," explains Habeeb Mahaboob, Head of Information and Communications Technology Advisory and Transformation at Tech Mahindra. So when the CIO of a banking client wanted to differentiate his business, Tech Mahindra helped create a mobile numerology application. The software gives prospective customers a personalized account number that is automatically generated using an algorithmic combination of the birth date and letters of the person's name. "That's a classic example of how IT has made a difference," Mahaboob says. "And it's increased the number of people becoming customers of the bank." Big data is another area high on the agendas of many CIOs. Why? In large part, because today, an estimated 98 percent of all stored information is digital, up from 75 percent as recently as 2000, according to a 2013 report by the Council on Foreign Relations think tank titled, "The Rise of Big Data." This fast-moving shift, which includes unstructured data created by social media, blogs and online videos, is a huge driver of the move toward not only big data, but also new data analytics and business intelligence tools to make that data actionable for business. Last year, when TCS surveyed more than 1,200 companies worldwide, it found that big data initiatives had already been undertaken by half of them. Big data projects are far from simple. TCS says the biggest challenge that businesses face is overcoming organizational silos. This is a cultural challenge that cuts across functions and divisions, and at times prevents companies from turning this data into actionable insights. Until an organization's raw data is collected and analyzed, it's just a pile of meaningless bits and bytes. When done right, however, big data has many applications. For example, one airline working with Tech Mahindra wants to glean the structured BI from the scads of raw unstructured data ﬂowing in from airline staffers, in order to optimize ﬂight routes around weather patterns. "We want to bring them the kinds of analytics they'll need to get meaningful insights and to make better decisions for their business," says Mahaboob.